Economics With Alex: The Invisibility Cloak: Bad for Human Rights? There was some dramatic news last year. Scientists in Germany have apparently been getting very close to making an invisibility cloak. For the first time ever, through innovations in light-bending materials, a small object was made invisible from all angles. Though the technology is not yet usable in a Harry Potter-like fashion, the development of a cloak one could just throw on to become invisible may only be a few years away. 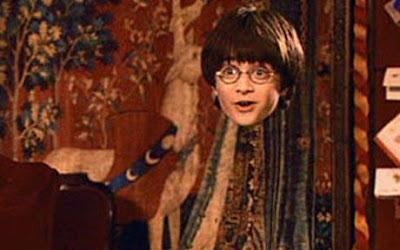 Now before all you sci-fi and fantasy fans go nuts, just ponder the question: what are the possible uses for an invisibility cloak? I think you'll come to the conclusion that an invisibility cloak would mostly be useful for two things: mischief and mayhem. If invisibility cloaks became widely available to the public, the crimes of peeping toms, shoplifters and murderers for example would all become easier to get away with. Which brings me to the subject of human rights. To understand the full ramifications of widespread invisibility, it's useful to become familiar with the idea in law and economics, of a mathematical equation for the "optimal punishment" for a crime. Donald Wittman's excellent textbook on law and economics explains this concept the best. Because not all criminals can be caught, in order to make them face the full costs their crimes bring upon society "...the expected punishment, probability of being punished (P) times the fine (F), is set equal to the harm of the crime. That is PF = H. Thus the lower the probability of being caught, the higher the level of punishment should be." In other words, for the legal system to adequately dissuade people from committing crimes, two things are possible: 1) increasing the probability of catching the criminal, or 2) increasing the punishment. So the necessary punishment F varies inversely with the probability of being caught. So if suddenly it were half as likely for someone to get caught for a particular crime, to maintain optimality, the punishment must become twice as harsh. This seems to explain at least in part why countries without advanced systems of crime detection and law enforcement (low P) may punish small crimes with huge punishments (high F, e.g. cutting off someone's hand for shoplifting, or hanging, drawing and quartering for various crimes in medieval England). So what does this have to do with invisibility cloaks? Clearly, (no pun intended), if invisibility cloaks became cheap and widely available to criminals, the probability of getting caught (the P in the optimal punishment equation), for many crimes would decrease. Most crimes would become easier to get away with by use of an invisibility cloak. But not only would it help in the perpetration of crimes, an invisibility cloak would help people resist arrest for any crime, even those not utilizing invisibility, such as cybercrime and fraud perhaps. If the cops came to your door, you could just slip on your invisibility cloak and make a break for it. So in a world of widespread invisibility crimes, to once again make criminals fully face the costs they bring to society, the legal system could greatly increase F, the punishment, or alternatively attempt to bring P back up to its original levels, perhaps by becoming ever more invasive into peoples lives. Either way an invisibility cloak sounds like bad news, both for the possible victims of invisibility related crimes and for human rights in general. I personally wouldn't want shoplifting a pack of gum to be punishable by years in prison just because pesky invisible people have ruined the legal system for everybody. Haven't these scientists seen "Hollow Man" or "Predator"?